The highly anticipated musical crossover between The Flash and Supergirl finally arrived. 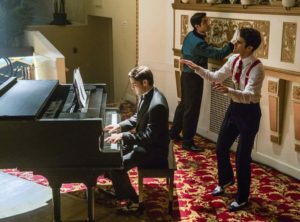 After Monday’s episode of Supergirl concluded with Kara meeting the Music Meister and falling into a coma, the Music Meister made his way to Earth-1’s Central City in the hopes of bringing Barry into the same world Kara has been forced into. Once Barry is placed into this world we quickly find out that he and Kara are trapped in a musical and the only way to get out is to complete the story, giving in to their musical urges along the way. “Duet” is the episode season five of The Flash needed. One major issue The Flash has had recently is the overall dark tone and lack of fun. Not only did “Duet” contain some pleasing musical numbers and loads of fun, it was also pretty funny. From the goofy lyrics in the duet “Super Friend” between Grant Gustin’s Barry and Melissa Benoist’s Kara to Kara’s obsession with The Wizard of Oz, there were plenty of moments to make fans smile. Gustin and Benoist’s musical backgrounds, having both been on the Fox series Glee, definitely benefited their performances. Joining them in song was fellow Glee alum Darren Criss as Music Meister, as well as Jeremy Jordan’s Winn from Supergirl and Carlos Valdes’ Cisco, who also both have musical backgrounds prior to landing their roles on their respective series. Additionally, Jesse L. Martin, John Barrowman, and Legend of Tomorrow‘s Victor Garber are also able to strut their stuff. Overall, the songs in “Duet” were enjoyable and provided a mix of covers and originals, the stand out ones being Melissa Benoist’s take on “Moon River,” “Super Friend,” and Grant Gustin’s song which concluded the episode, “Runnin’ Home To You.” My only complaint in regards to the music is there should have and could have been way more. There was only a total of five musical numbers, two of them being covers, one of which included a cover of Jackie DeShannon’s “Put a Little Love In Your Heart” performed by Darren Criss, Jeremy Jordan, Carlos Valdes, and John Barrowman. I’m hoping this isn’t the only time The CW attempts to do a musical episode in their Arrowverse, and maybe we’ll get to see another one next season, possibly taking place on Supergirl. It was definitely great seeing both Mon-El and Martian Manhunter make their way to Earth-1, being that the two of them were not able to make the trip in the last crossover. We even got to see some neat team-up action between with Martian Manhunter, Kid Flash, and Cisco, a.k.a. Vibe, as they attempt to take down Music Meister. With the exception of there not being enough songs, I don’t have that many complaints about “Duet.” As stated before, “Duet” added some much needed fun to The Flash‘s third season, which has been lacking in recent episodes. 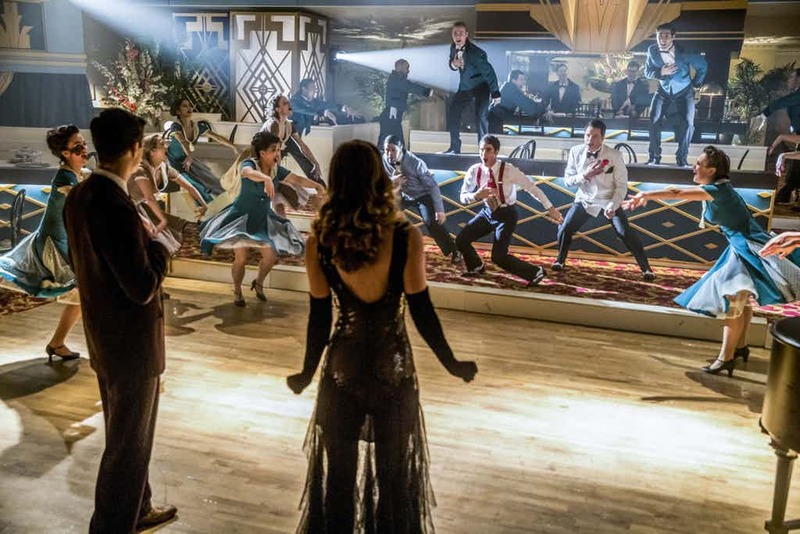 “Duet” was fun, funny, lighthearted, and concluded with a very satisfying song by Gustin’s Barry Allen as he sings and completes a second, proper marriage proposal to Iris West. Of course Iris doesn’t turn him down this time, because how can you not say “yes” to a singing proposal. This is a bit of a nitpick, but that final song was a bit weird considering it didn’t take place in the imaginary world Music Meister created. Another nitpick I have is Barry’s sudden knowledge of Superman during the song “Super Friend,” but I’m willing to look past it. If you enjoyed the music from this week’s episode of The Flash, the songs are available for purchase on iTunes. 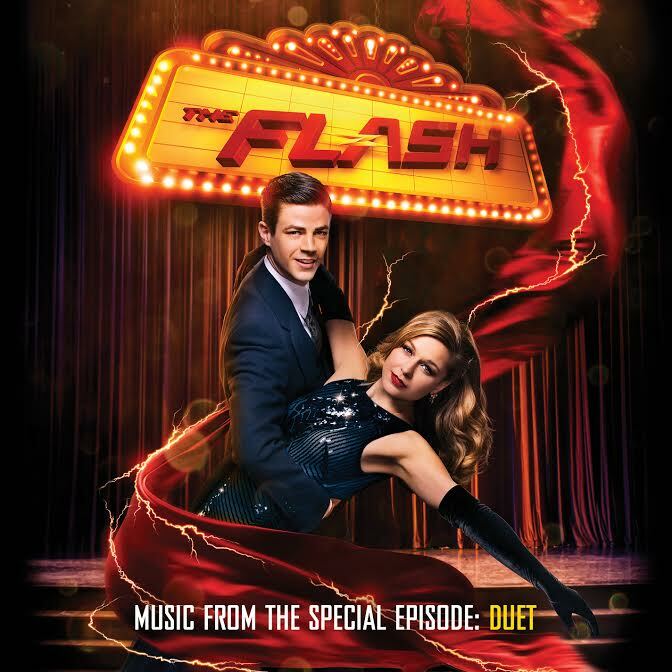 In addition to the five songs featured in the episode, the download also includes Music Meister’s instrumental theme “Meet the Music Meister” by series composer Blake Neely, as well as an alternate version of Grant Gustin’s “Runnin’ Home To You.” Check out the cover for the digital album below and feel free to let us know what you thought about “Duet” in the comments.